We were snorkeling in the north part of Hakahetau’s bay when we saw a Manta Ray with a 10 foot wingspan swimming towards us. A fat remora hung to the white underside of the Manta as the spaceship-looking creature banked a big turn. I held my breath longer than was comfortable as it gracefully swam along the reef’s edge. These encounters with majestic wildlife leave us giddy with delight! 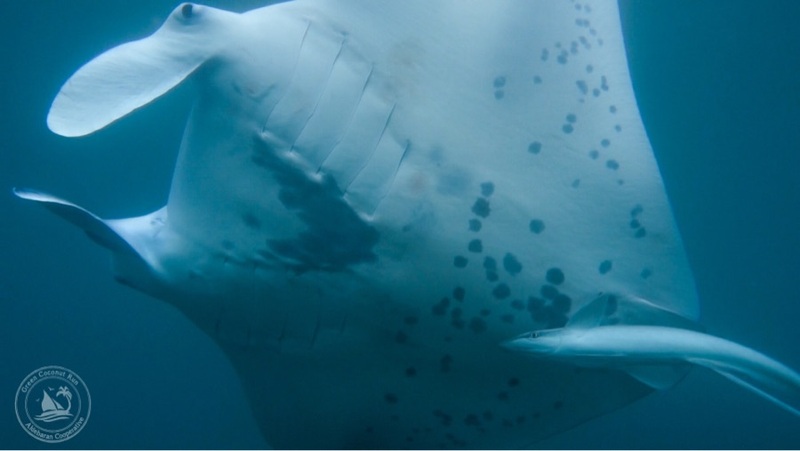 Notice the unique black markings on the Manta’s underside, similar to a Rorschach test – ecologists use these markings to identify Manta individuals. We were snorkeling at the school kid’s marine reserve in the village of Hakahetau, NE corner of Ua Pou island. It is one of six EMMAs (Educational Marine Managed Areas) in Marquesas. We were introduced to the project by Pascal, the director of Motu Haka nonprofit, who lives in Hakahetau. We’re proud that Green Coco’s community recently helped them raise over $2,000 in funds! Our raffle of Marquesan handicrafts was a success, and it helped the Ua Pou school kids attend a marine protected area conference in Chile to share their idea with the world. So cool to swim with Mantas! I am looking forward to seeing what the EMMA (GCR sponsored) group did in Chile. Please include information for how to contact their mentor, Pascual. You can find him on Facebook under “Pascal Erhel Hatuuku”.